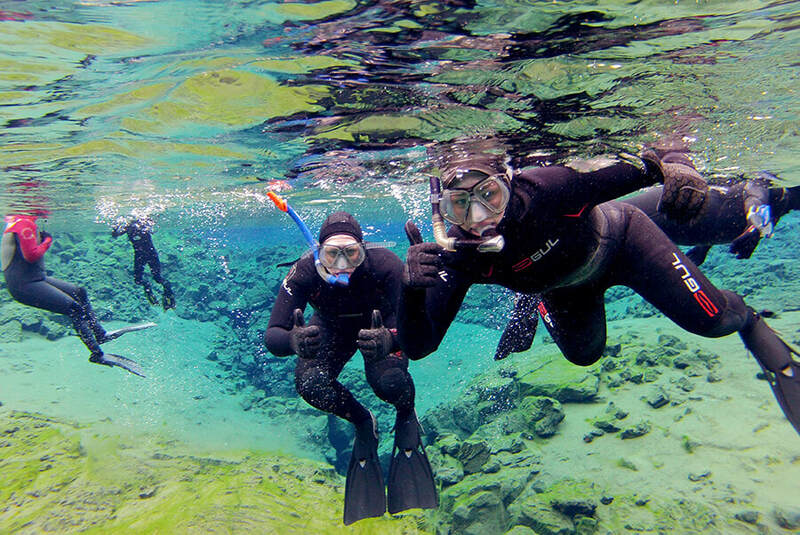 Snorkeling in a wetsuit in Iceland may sound like a daring idea but as soon as you dive into the pristine glacial waters of Silfra, your mind shifts away from the cold as you are immediately absorbed into exploring the vivid colours of this stunning, exotic underwater fissure. Silfra is situated in Thingvellir National Park, where the earth drifts apart around 2 centimeters every year as the North American and Eurasian tectonic plates move in opposite directions – creating such natural wonders as is Silfra. 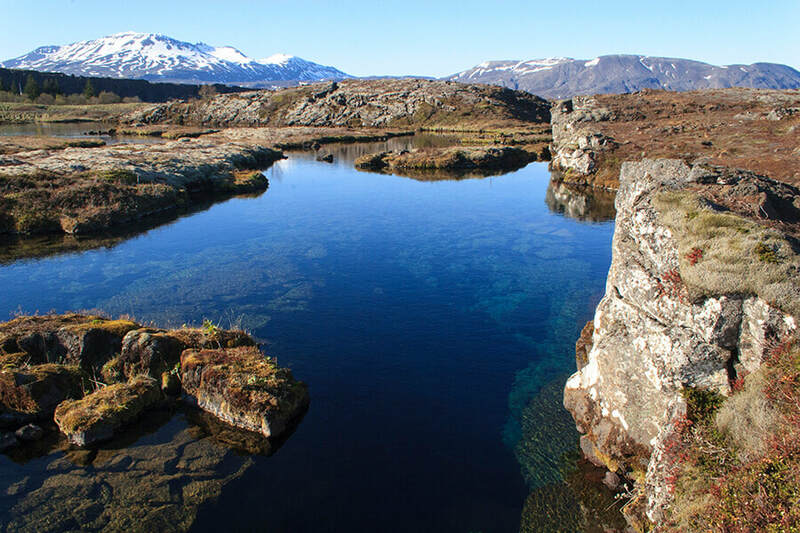 Glaciers melt and fill this deep crack with the clearest water that has been filtered for a century through volcanic lava rock before entering Silfra from the ground up. 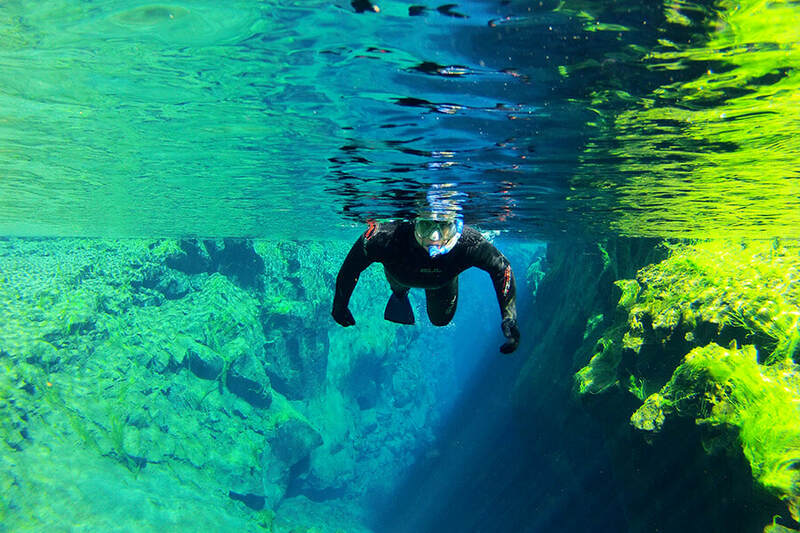 With an incredible visibility of more than 100 meters, Silfra is ranked as one of the clearest waters in the world - making your snorkeling experience feel like flying. However, one of the clearest water in the world comes with a price, as the temperature lingers around 2-4 degrees Celsius all year round (35 degree Fahrenheit). The wetsuit covers your whole body, but it won’t protect you entirely from the just-above freezing glacial water – but our wetsuit does an amazing job of keeping you relatively warm. Those who prefer to stay dry and warm should opt for a drysuit instead. Unlike the drysuit, which allows you to float on the surface, the wetsuit enables you to dive a little under the surface to explore the beauty of Silfra a bit closer. We only recommend the wetsuit for our more adventurous participants because of the cold – but it will be absolutely worth it for those who are up for the challenge! GoPro rental – 6900 ISK.